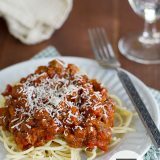 My all-time favorite spaghetti sauce recipe. Simple ingredients come together to form a sauce full of vegetables and meat. Brown ground beef and sausage with onion. Add garlic. Add carrot and parsley – cook for a few minutes. Put the remaining ingredients in pot and simmer at least 20 minutes.